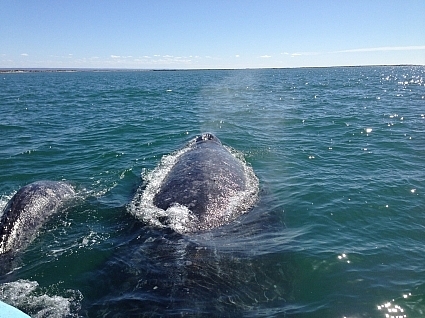 The Amazing Gray Whales of Baja is our flagship and most popular tour! Experience the beauty and awe-inspiring marine wildlife of the Baja peninsular in Mexico – one of the finest destinations in the world for watching majestic and friendly Pacific gray whales. It is also one of the key locations for blue whale sightings around the islands of the Loreto Marine Reserve. We visit the stunning western side of the peninsular to observe the gray whales in the protected birthing lagoons of Puerto Lopez Mateos, which boasts a spectacular coastline – white sand dunes, marshes and mangrove swamps – sanctuary to many resident and migratory sea birds. It is from here we go out in traditional boats (Pangas) to observe Pacific gray whale mothers and calves which frequently approach the boats and who appear to be as curious about us as we are about them. To interact so closely with these gentle giants of the ocean is a truly moving experience. Close encounters with mother and calf pairs are a frequent occurrence offering an unsurpassable opportunity to observe and photograph these awesome marine mammals. Nic Slocum PhD FRGS is your expert guide. Nic is a life-long conservationist and zoologist with over 30 years experience in whale watching and marine conservation all over the world. He will answer questions and provide informed comment throughout the tour. Local boat handlers are used for their vast knowledge and expertise. Each one is carefully selected and complies to strict safety and national engagement protocols. The Pacific gray whale (Eschrichtius robustus) undertakes one of the longest migrations in the animal kingdom, a 10,000 mile round trip each year. From feeding grounds in the Bering and Chukchi Seas they travel down the Pacific seaboard of North America to the quiet and warm lagoons of Baja where they will calve and nurse their young. 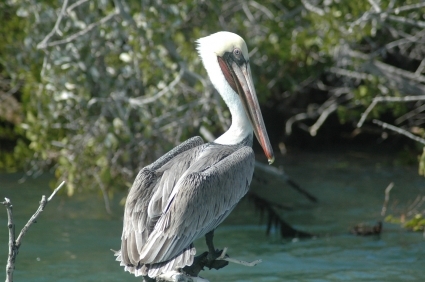 February is the primary month for viewing these awe-inspiring animals in Baja. Reaching lengths of up to 50 feet and weighing up to 35 tonnes they are among the largest whales on the planet. Their gentleness and curiosity around boats however, is legendary. In addition to whales and dolphins, we can also expect to encounter the California fur seal (sea lions) and many unique bird species…this is a bird watchers paradise. We also offer the opportunity to travel up into the spectacular mountains of the Sierra de la Giganta. The canyons and cactus fields among these fabulously beautiful mountains have to be seen to be believed. This tour is truly one of those ‘must-do’ once-in-a-lifetime experiences! Nic Slocum has been watching large whales from boats for 30 years, from humpbacks and fin whales in Ireland to Southern Right whales in Patagonia and Pacific gray whales in Mexico. He has been instrumental in putting together one of the most comprehensive codes of conduct for boat based human – whale interactions right down to the species level and is an established authority on the threats currently faced by this unique group of marine mammals. A zoologist by training, he has published articles on conservation related issues in both regional and national newspapers. Nic Slocum divides his time between West Cork, Ireland and other iconic whale watching destinations around the world. 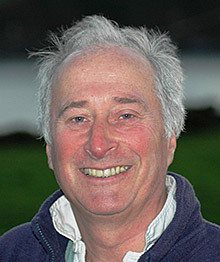 In addition to running Whales Worldwide he is the director of Whale Watch West Cork which runs boat based tours to watch and photograph whales and dolphins off the coast of southwest Ireland. 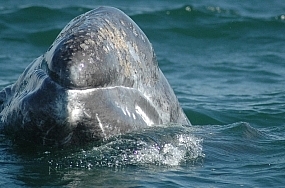 The Amazing Pacific Gray Whales of Baja wildlife adventure starts and finishes in Los Angeles, USA. Day 1. Thursday. The adventure begins. Arrive Los Angeles International Airport. Staying one night close to the airport in one of the excellent airport hotels – a chance to unwind or simply catch up on some sleep. Day 2. Friday. We fly down to Loreto, Baja California Sur leaving at around 9.30am. There is only the one flight a day to Loreto and it takes around two and a half hours affording you the first glimpses of this amazing Mexican desert peninsular and coastline from the aircraft. We arrive in Loreto early afternoon and settle into our hotel, La Mision on the Loreto waterfront, close to the old historic district and overlooking the Sea of Cortez. Evening is free time to explore the area and get to know Loreto meeting at “La Palapa” for Margarita’s and to talk through the weeks itinerary and activity programme. Day 3. Saturday. We head off for a day tour to Puerto Adolfo Lopéz Mateos on the Pacific side of the Baja peninsular to see the Pacific gray whales and their two tonne calves! Although you can see the whales from the land here we hire a Panga (local boat) with a local boat handler and head out on the calm waters of the lagoon looking for these huge mammals. The more inquisitive animals may approach the boat affording us excellent close viewings. Day 4. Sunday. Today we do something entirely different. We head up into the mountains of the interior of the Baja peninsular, the Sierra de la Giganta, to visit the cave murals, the cuevas pintas, in the rock shelters and canyons of these impressively beautiful mountains. We will also stop at the old mission of San Francisco Javier De Vigge-Biundo (thankfully San Javier for short! ), the second mission to be established on Baja in 1699 and one of the best preserved. It is still in use today. The mission nestles at the base of the mountains in an oasis of green palms and colourful flowering bougainvillea. Day 5. Monday. We take a boat based whale and dolphin watching tour out of Puerto Escondido near Loreto looking for the great baleen whales - blue whales - the largest mammals on earth. There is a good chance during February of catching up with the giant blue whales as they move in around the islands of the Loreto Marine Reserve. Several dolphin species frequent the area including bottlenose and common dolphins. Their larger cousins, pilot whales and killer whales are seen more rarely. Day 6. Tuesday. A tour to Coronado Island from Loreto, one of the prettiest islands in the Bay of Loreto national marine reserve. After a boat based tour looking for all types of marine wildlife; bird species like frigate birds, turkey buzzards, osprey and the engaging blue footed booby, local California fur seals and usually bottlenose dolphins; we will spend time exploring this fabulously beautiful volcanic island. The islands dotted around this part of the Sea of Cortez are stunningly attractive with unspoiled, sun drenched white coral sand beaches and out of this world rock formations; with lovely desert scenery and plants with many unusual species of cactus and succulents adapted to the harsh, dry environment. One delight of this day tour is to lie on your back on the white sand beach and watch the frigate birds and turkey buzzards cruise overhead. There are some lovely photography opportunities on this tour for the amateur and the more professional photographer alike. Day 7. Wednesday. We head back to Puerto Lopez Mateos to see the Pacific gray whales again. Heading out in our Panga we will look for the adult animals and may see breaching and tail lobbing behaviour. Day 9. Friday. Free time in the morning for final sightseeing or shopping in the old Spanish district of Loreto prior to making the short transfer to Loreto airport for our afternoon flight back to Los Angeles. Many customers decide to stay on over the weekend in Los Angeles to take in the sights and sounds of this vibrant city. Our whale watching base is the traditional old fishing town of Loreto on The Sea of Cortez. Loreto was the first Spanish settlement on Baja and the Spanish influence is still clearly evident in the old town today. We stay in the prestigious La Mision Hotel, widely considered to be the best hotel in Loreto, with fabulous views over the serene and calm Sea of Cortez - dubbed by Jacques Cousteau “The Aquarium of the World”. February can also offer superb sightings of the largest animal on earth, the Blue Whale (Balaenoptera musculus) along with different dolphin species. All ground transportation from the airport to our hotel. Hotel accommodation at La Mision Hotel in Loreto, widely considered to be the best hotel in Loreto. All whale watching tours and boat based island tours. All transport where required including tours into the Sierra de la Giganta mountains. We include lunch ONLY on the days we are taking day tours. Sometimes we take it with us when going out to the islands at other times we will stop at a local Palapa for lunch. Flight to and from Los Angeles. We will help in researching the best airfares for you if required. We don't include hotel accommodation on the outward or return leg at Los Angeles airport as many customers take extra time to explore Los Angeles and this area of California as a holiday extension and wish to select their own accommodation. We don't include breakfasts or evening meals. We find most customers want the flexibility to be able to do their own thing. Alcoholic beverages you might require at anytime. Any tours or vehicle hire you require outside the published itinerary. We can help with the arrangement of anything you might like to do.